New Zealand and some Dingos. Anything transmission or diff i can help price or rebuild for you. From the moment your foot hits the gas, Eaton Performance differentials are at work efficiently maximizing wheel traction. Motive Gear uses the highest quality standards of manufacturing. From machining and finishing to heat treatment we demand the best. AND 100'S MORE Brands can use. Fast communication and overnight delivery of exactly what I wanted, highly recommended. Awesome trade thanks Dan. The MSD goes great. Will trade with you again that's for sure. thanks dan for all your help with the 9" gear set & bearing kit highly recommend to deal with I have recommend you to other races, car clubs, family & friends. I've dealt with just about every performance parts suppliers in NZ and I've found Dan is the only one that treats you like a mate and not just another cash sale! Finally someone who will go the extra mile for you and not charge like a wounded bull! Cheers Dan and look forward to doing more business with ya!!! Dan: bring the car around when shes going paul! hope the headers sounds mint! 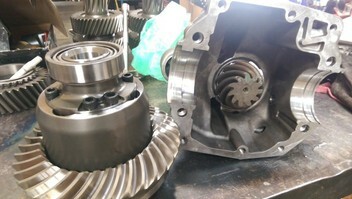 diff gears arrived well packaged, quick postage, good communication thanks Dan great deal, i would definitly trade again. Recomend him..
Dan: Hope the gears are going good mate, thanks once again! Great service, my new MSD distributor works well. Dan gave me a excellent service on parts ,9inch gear set,bearing kit,etc,i highly recommend him to other buyers,thanks.